North America will remain dominant in the global vapor recovery services market throughout the forecast period. North America held highest market value share and is expected to grow at a relatively faster rate. U.S. is projected to hold more than two-third of the market share in the global vapor recovery services market. On the other hand, Latin America and the Middle East and Africa will account for a relatively lower market share and are expected to witness steady growth. These are some of the findings presented in a recent publication by Persistence Market Research titled “Vapor Recovery Services Market: Global Industry Analysis and Forecast, 2017–2025.” The analysts have observed that the U.S. is predicted to provide great opportunities in the global vapor recovery services market as compared to other regions of the world. In sync with the same, companies across the globe are highly focused on increasing their business portfolio and effectiveness in order to capitalize on existing opportunities in the country. The expert team of analysts have further observed that market players are focused on creating long-term relationships with direct end users, especially for scheduled annual maintenance contracts to sustain a continuous revenue flow. In the case of GDP growth forecast, it has been observed that global economic growth is likely to impact the vapor recovery services market during the forecast period. Key developments in the oil and gas industry are anticipated to have a high impact on the vapor recovery services market. Capital expenditure growth plays a vital role and has a major impact on the vapor recovery services market; consequently, maintenance expenditure in the oil and gas industry is anticipated to affect the vapor recovery services market. Adoption of vapor recovery units is predicted to affect the vapor recovery services market with medium impact. The analysts have studied various market segments extensively while examining the global vapor recovery services market. Market analysis includes revenue forecast, Basis Point Share analysis, Y-o-Y growth projections, absolute dollar opportunity analysis and market attractiveness analysis. Macro-economic indicators such as GDP and industrial production index have been considered while forecasting market numbers. Weighted Average Selling Price (ASP) has been considered to deduce market values. Top-down approach has been used to assess market numbers for each category, while bottom-up approach has been used to counter validate the market estimations. The analysts have collected insightful information through sources such as World Bank and IMF data, companies’ annual and financial reports and industry association publications. In-depth secondary research has been used to ascertain overall market size, top industry players and industry associations. In order to conduct expert and industry interviews, Persistence Market Research has formulated a detailed discussion guide based on which the analysts have conducted interviews with industry experts, players, distributors and retailers. The forecast presented in this report assesses the total revenue of the global vapor recovery services market. When developing the market forecast, the starting point involves sizing the current market, which forms the basis for forecasting how the market is anticipated to take shape in the near future. The outcome of the research is triangulated based on various demand and supply side analyses. The report also takes into consideration year-on-year growth to understand the predictability of the market and to identify the right opportunities across the global vapor recovery services market. As previously highlighted, the market for global vapor recovery services is split into various categories. All these segments have been analyzed in terms of basis point share to understand segmental contribution to overall market growth. This detailed level of information is important for identifying various key trends in the global vapor recovery services market. The U.S. accounted for sales of more than US$ 160 Mn in 2016 and is estimated to gain 130 basis points by 2025 as compared to that in 2017. The market is expected to increase at a CAGR of 8.5% over the anticipated period. 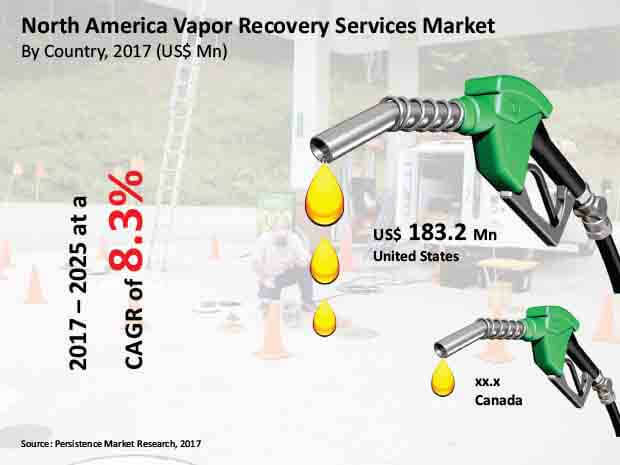 The U.S. market will likely dominate the North America vapor recovery services market throughout the period of assessment. The country is estimated to hold more than 70% market share of the North America vapor recovery services market. The EPA regulation of 2011 has called for higher VOC emission recovery, which in turn has created new market opportunities for VRU manufacturers. As a result, various key players headquartered outside the U.S. are now entering the country. Expected increase in oil prices by 2019 is also expected to boost overall VRU sales in the region. As U.S. is a prominent player in the vapor recovery services market. Key players in the vapor recovery services market are planning to expand their footprint in the US market. Due to the global oil crisis in recent years, key players in the North America region were impelled to focus on strengthening their storage and distribution capabilities to minimize losses. Storage tanks play an essential role in addressing the on-time consumer demand as well as maintaining stockpiles for future demands. A rapid increase in the number of crude oil storage tanks accompanied with vapor recovery units in recent years makes it evident that crude oil producers are focusing on optimizing the storage and distribution process to tackle the growing crude oil price crisis. Imposition of stringent emission norms by the government and environmental agencies in North America is inciting crude oil producers to minimize environmental impact through the integration of sustainable technologies such as vapor recovery units. All these factors are creating a positive impact on the North America vapor recovery services market. The VOCs released from various oil and gas storage facilities and during transportation operations are becoming a major environmental concern for the different government and non-government organizations in North America. These compounds are hazardous air pollutants. To reduce the harmful effects of VOC emissions, environmental legislations have been implemented in various countries of North America pertaining to emission standards. These regulations have compelled key players in the crude oil production and petroleum industry in the U.S. to install vapor recovery units at various locations, thus fueling market growth in the region. Crude oil storage tanks contain light hydrocarbons such as methane, natural gas liquids and hazardous air pollutants along with some inert gases. During storage, these gases vaporize and get collected in the storage space. As the liquid level in the tank fluctuates, vapors are vented out into the atmosphere. Vapor recovery units are used to collect these hydrocarbons, which can then be sold and used as fuel in onsite operations. All this leads to significant cost savings. Vapor recovery units also help reduce the emission of methane. These factors are expected to boost the development of the vapor recovery services market in North America. The Midstream/Downstream process segment is forecast to exhibit a CAGR of 8.4% in terms of value in the North America vapor recovery services market. By application, the Storage Tank Vents segment is anticipated to hold more than 60% share of the North America vapor recovery services market by 2017 end. The O&M Services operation segment is estimated to register a healthy CAGR in the North America vapor recovery services market during the forecast period.